The suspended officials are being investigated over allegations they pressured Kiev’s police chief to use violence against the protesters. 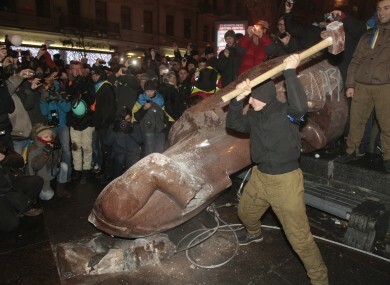 An anti-government protesters beats a statue of Vladimir Lenin with a sledgehammer during protests in Kiev last week. THE MAYOR OF Kiev and the deputy head of Ukraine’s security council have been suspended after a brutal police crackdown last month on a pro-EU opposition protest in the capital. President Viktor Yanukovych, who ignited three weeks of demonstrations by rejecting a pact promising closer ties to the EU, announced the move by saying the two officials were suspected of “breaching the constitutional rights of citizens” taking part in the protest. Baton-wielding riot police roughly dispersed around 1,000 protesters camped out on Kiev’s Independence Square in the early hours of 30 November, injuring dozens. The two suspended officials, mayor Olexander Popov and Security Council deputy chief Volodymyr Syvkovych, are being probed on suspicion of pressuring Kiev’s police chief “to use violence” against the protesters, Prosecutor General Viktor Pshonka told journalists. Pshonka said prosecutors would ask the courts to put the the mayor, the deputy security council chief and the police chief, Viktor Koryak, under house arrest for overstepping their authority. The dramatic announcement came as Yanukovych supporters mounted a Kiev rally right next to the camp of pro-EU protesters demanding his resignation. Organisers put their number at 200,000, while police estimated 60,000 people attended. Both figures appeared inflated, according to AFP correspondents at the scene, Kiev’s Europe Square. At the nearby Independence Square, anti-Yanukovych demonstrators furious at the president’s refusal to sign the Association Agreement with the EU are camped out behind barricades. The opposition called the rival rally a staged event by Yanukovych’s Regions Party, alleging that state employees were brought in under threat of being fired. They said they feared the aim was to disrupt their camp. Police on Saturday filled the street in the 200 metres separating the rival demonstrations. “Don’t divide Ukraine, don’t build barricades,” Prime Minister Mykola Azarov urged at the pro-government rally. “The politicians who promote hatred and division of Ukraine don’t belong in today’s politics. Their place is at the garbage dump,” he said. The Ukrainian president is under intense pressure to decide whether to align his nation with the West by signing a deal with the EU, or to join a Moscow-led Customs Union. The opposition hopes to stage a record rally tomorrow, two days before Yanukovich is to travel to Moscow to meet Russian President Vladimir Putin amid rumours he will agree to join the Customs Union. Yanukovych on Friday held talks with the three main protest leaders — the head of the UDAR party Klitschko, nationalist leader Oleg Tyagnybok and the head of the party of jailed opposition leader Yulia Tymoshenko, Arseniy Yatsenyuk. The talks were chaired by post-Soviet Ukraine’s first president, Leonid Kravchuk, and were also attended by top church leaders, the parliamentary speaker, the foreign minister and other top figures. The negotiations came after Ukraine’s richest man and hugely influential powerbroker, Rinat Akhmetov, called on all parties to find a peaceful solution to the crisis. The United States has made its solidarity with Ukraine’s opposition clear, even threatening sanctions after a failed police raid on protesters Wednesday. Outspoken Republican Senator John McCain has announced he is heading to Kiev this weekend. Russian Foreign Minister Sergei Lavrov meanwhile accused Western countries of losing “their sense of reality” over Ukraine’s crisis and using blackmail to cut off the country from Russia. Email “Ukraine suspends mayor after brutal police crackdown on protesters”. Feedback on “Ukraine suspends mayor after brutal police crackdown on protesters”.